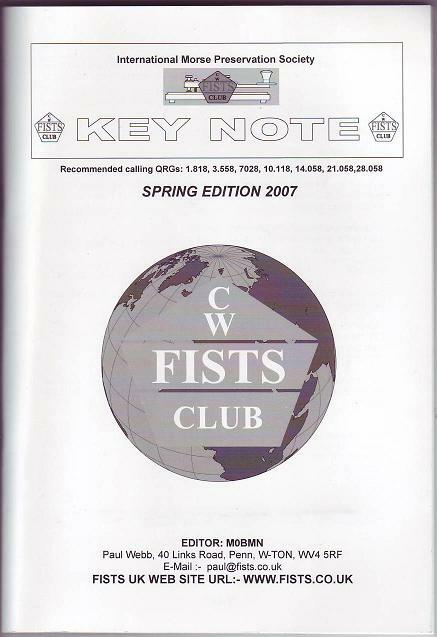 You can view or download previous versions of Key Note, the FISTS club newsletter/magazine from the Archive below. 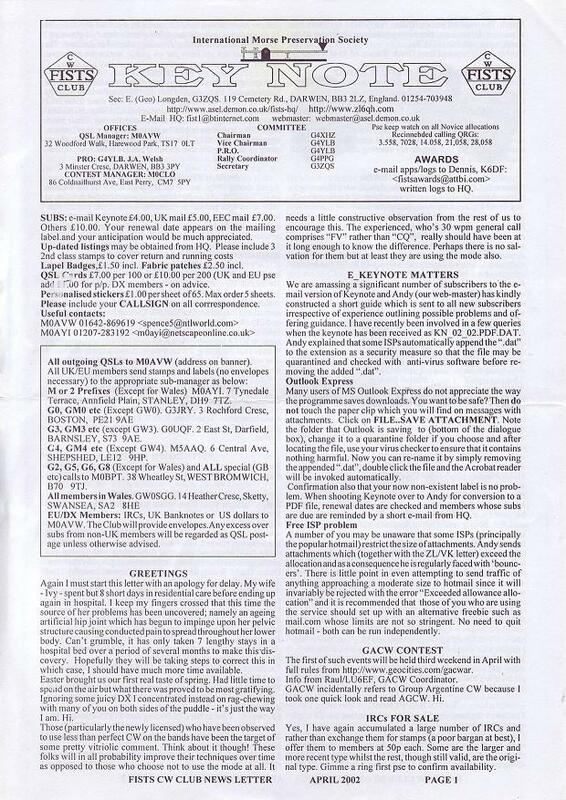 Starting in October 1987, the club newsletter (later named Key Note) was published monthly by Geo G3ZQS in an A4 (close to USA Letter size) format. In 2007, Paul M0BMN published the first quarterly Key Note in its current A5 booklet format. This web page can be used to access Key Notes from 12 months ago back to October 1987. FISTS members can access more recent Key Notes from the Members' Area Key Note Archive. They are held as PDF files. Many Key Notes starting from 2008 are also available from this page and the RAIBC website in an abridged form as MP3 audio files recorded by Chris G5VZ. I would like to add more Key Notes to the archive. The ones needed are from 1987-1988 and also those below that have a yellow background. If you have any electronic copies, or if you have paper copies and are willing to let me borrow them, please send an email to . This section contains Key Notes from 12 months ago back to October 1987. FISTS members can download more recent Key Notes from the Members' Area Key Note Archive. Some of the issues have mistakes in the year and month names printed on the pages. Please see the Notes section for a list and other information. To open a Key Note, please click on its link. To save a copy, right-click on the link and choose Save Target As... (Internet Explorer) or Save Link As... (FireFox). Key Notes from December 1999 and earlier are scanned images stored in PDF files and as far as possible are exactly as distributed, including sometimes being printed at an angle. In a few places the type was illegible after scanning and has been repaired. While it would be desirable to convert these back into text to allow indexing and use of screen readers, it would be a very time-consuming undertaking. June 2001 edition says "May 2001"
May 2000 edition says "April 2000"
July 1999 edition says "July 1986"
May 1994 edition says "May 1993"
September 1992 edition says "September 1991"
November 1990 edition says "August 1990"
December 1989 edition says "December 1998"
There were two May 2005 issues; the first from FISTS Down Under due to Geo's ill health and then a second one from Geo. Thanks to Ralph ZL2AOH for providing copies of the 2000-2006 and other Key Notes, Ron G0MRH for spending countless hours scanning 1993-1999, David VK3DBD/G3SCD for scanning November/December 1999. Piet PA3AFF for providing copies of 1989-1993 and December 1988, Vince G0CVH for providing October 1987 (the first ever issue! ), Chris G5VZ for recording the audio versions, the editors Geo G3ZQS and Paul M0BMN and of course the many contributors over the years.